Including: Morganton, Glen Alpine, Drexel, Valdese, Rutherford College, Connelly Springs, Icard, Rhodhiss, Hildebran, Lake James, and surrounding areas. Save a Life! Spay & Neuter your pets! Southern Lifestyles 820 West Union Street, Morganton NC 113 Clearwater Dr.
RE/MAX: The #1 name in real estate* is now serving this region’s Buyers and Sellers! 2016 REALTOR of the Year! Voted 2013 Best Real Estate Agent! 2015 REALTOR of the Year! 244 WEST PARK DRIVE Designed for entertaining! Large windows flood home with sunlight, & open living spaces flow seamlessly. 4 Bedroom, 2 1/2 Baths. $337,000 MLS:30183 Text R234092 to 52187 for more photos and information. Most of my listings have SOLD!! Call me today to get your home SOLD too! Landyn Story Broker/ Admin. Asst. Thanks for a record 2016! After closing 58 transactions resulting in over $8,000,000 * in sales. I have joined forces with the number 1 names in Real Estate. ** I look forward to providing home town service with the support and exposure provided by RE/MAX. I represent both Buyers and Sellers. Call me and let my service impress you! Let’s put the sign of success in your front yard! *Data from Burke County & Catawba Valley MLS Systems **As measured by residential transaction sales. Text any of the codes below to “52187” for instant viewing on your Mobile Phone! 302 S. COLLEGE ST. $299,000 Commercial Property - 10,646 Sq Ft. building on corner lot in great high traffic location. Currently being used as dry cleaners. Includes additional adjoining vacant lot. NEW LISTING 1395 ROBINHOOD DR. $229,000 3BR 2BA home in great subdivision features 2000+ HSF including large bonus room, cathedral ceilings, 2 car oversized garage w/ utility room, nice landscaping. 4712 MORNING STAR CHURCH ROAD $139,900 Like New 2BR 2BA log home on private lot convenient to I-40 at exit 96. Full unfin. bsmt, wrap around porch. NEW LISTING 102 WHISNANT STREET $86,900 2BR 1BA home features 1216 HSF, replacement windows, new roof, double garage. Natural gas heat, central air, large sunroom. Salem Area. Text any of the codes below to 52187 for instant viewing on your mobile phone! NEW LISTING! 117 NORTH RIVER GLEN DR. $189,900 Beautiful 3BR/2BA home situated on wooded 1.12 acre in desirable River Glen Subdivision. One level open floor plan features cathedral ceiling & gas FP in living room. MLS:30218 Text R240369 to 52187 UNDER CONTRACT! DUE TO DAILY CHANGES TO OUR RENTAL LIST, PLEASE CALL THE OFFICE FOR AVAILABILITY. Rent/Security Deposit 225 N Anderson St.
2BR 1 BA HOUSE, stove, frig. No pets. 3BR 1 BA HOUSE, stove, frig, yard work included. 2BR 2BA MOBILE HOME Stove, frig, microwave. Alder Springs, 450 College St.
1BR 1BA APT. Brand new EVERYTHING! 2BR 1BA APT. Brand new EVERYTHING! 2BR 1.5BA APT Stove, frig, water/sewer included. Near downtown. Stove, frig, dishwasher. Near downtown. Stove, frig, dishwasher. 3128 BRANDON RD- 3BR/1BA home with newer roof, HP, and windows. Hardwood floors under carpet. Has 1 year APH warranty. All this for $94,900! MLS:30203 Text R238199 to 52187 UNDER CONTRACT! 3 PARCELS AVAILABLE - MOTIVATED SELLERS! DANDELION DRIVE, TAYLORSVILLE Sugar Loaf area *81.21 ACRES-Zoned Residential/Agricultural. Lots of timber & creek, many options. 101 PINE ST.-Brick, 2/3 bedroom, 1.5 bath, hardwood floors in town location.1 yr Home Warranty $70,000 MLS:30083 Text R199374 to 52187 MOTIVATED SELLERS! Text any of the codes to 52187 for more photos and information. 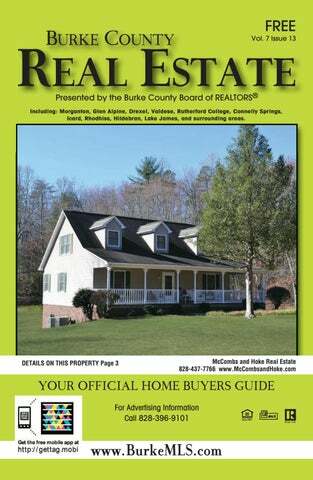 828.438.3660 Morganton: 121 East Union St. 828.584.3809 Lake James: 3238 NC 126 RealLivingCarolinaProperty.com Text any of the codes below to 52187 for instant viewing on your mobile phone! Text any of the codes below to 52187 for instant viewing on your mobile phone! 828.438.3660 Morganton: 121 East Union St.
828.584.3809 Lake James: 3238 NC 126 RealLivingCarolinaProperty.com Text any of the codes below to 52187 for instant viewing on your mobile phone! See Your Home Featured Here!!! Text any of the codes below to “52187” for viewing on your Mobile Phone! ONLY $11,900! Rentals: 209 Linville St- 2BR/1BA- $550 monthly, $550 deposit 2BR/1BA ranch in Morganton with one car garage. Avail Jan 2017 $750 Laurel Pointe, 3-4 month rental between Dec. 1 and May 1. $1,250/mo. which includes utilities (electric, water, and propane)$1250 sec dep. Currently seeking long term rentals to manage. Ask for Karen. Text R203245 to 52187 for additional photos and information. Text R144610 to 52187 for more photos and information. **WE HAVE MOVED** After 27 years of being at 214 Avery Avenue we have now moved to downtown Morganton. We are so thankful for all of the wonderful clients over the years that has made this move possible. We are very excited about being at our new location where we can give the best possible service to our clients on a daily basis. We hope to see you soon!!! 118 PIERCY AVE $89,900 Check out this 3 bedroom, 1 bath home with over an acre of land close to downtown Morganton. Includes a large storage building. Text any of the codes below to 52187 for more photos and information. To learn about a real estate career visit our website below. Sandra and her daughter currently live in Caldwell County, but would like to someday move to Burke County. Sandra fell in love with Burke County and its people, when she started substitute teaching in Burke County. Sandra just recently received her real estate license and is eager to start meeting people and helping them ﬁnd their new home. Sandra’s background is in retail management and education, and she hopes to use the skills from these two areas in her real estate career. In her spare time, she enjoys volunteering with Pet Partners Network, which helps dogs ﬁnd homes. There are a lot of “firsts” when buying a home. Calling a REALTOR® should be one of them. Making the decision to buy a home is a dream come true. But after the initial excitement, there are some realities to face: setting a price range, finding a place that fits your needs, home viewings, deciphering the jargon, negotiations, the paperwork—the list goes on and on. You need a REALTOR®, a member of the National Association of REALTORS®, to explain every detail and walk you through each step. REALTORS® know your local area, the ins and outs of the process and they always act with your best interests in mind. Call a REALTOR® to make your home buying dreams a reality. SELLER PAYS UP TO $3,000 BUYER CLOSING COSTS! LAND FOR SALE 9.9 ACRES! Maximum exposure to local REALTORS® and BUYERS! www.BurkeMLS.com REALTORS® are the best source for real estate information. Working with a REALTOR® gives buyers, sellers and investors the advantage they need to succeed in today’s market.